Catfish farming is the raising of catfish, from eggs to food size, in large, controlled environments. Mississippi was instrumental in the birth and progress of the US farm-raised catfish industry. Mississippians began commercially producing catfish around 1965 for a variety of reasons, including crop diversification, alternative crops for marginally productive lands, and the novelty of growing fish as a crop. Before catfish were produced in ponds, Mississippians supplied their fish needs by either catching their own or buying from commercial fishermen. When wild-caught river catfish could not fill the needs, aquacultured catfish began to fill the excess demand, and over time, many buyers came to prefer the consistent quality and quantity of pond-raised catfish. In the 1980s and 1990s the catfish industry became one of the most important agricultural activities across the South. Mississippi, Arkansas, Alabama, and Texas are home to 95 percent of all US acreage devoted to catfish production. In the early twenty-first century, the catfish industry was the largest aquaculture industry in the United States, far outstripping trout, the nation’s second-largest aquaculture industry. In 2006, Mississippi produced 53 percent of all US catfish sales, and in 2015 the state’s farms produced more than twice the catfish of Alabama, the next largest catfish producer. Catfish production occurs primarily in two regions, with 85 percent of the acreage located in the Delta. The remaining 15 percent is located in the east-central area of the state. The clay content in the soil in these regions allows for good water-retaining ponds. The Delta region has abundant water supplies from shallow aquifers, while East Mississippi catfish producers rely on surface water streams to fill their ponds. Catfish farming practices have changed over time. Production ponds have shrunk from between twenty and forty acres to between ten and fifteen acres today: management, feeding, and harvesting are easier in smaller ponds. Mechanization of catfish harvesting and loading have proven faster than earlier labor-intensive harvesting techniques, while improvements in aeration technology have increased production. Today, most Mississippi catfish operations sell their fish directly to processing plants and no longer operate retail outlets. In the early 1970s the Catfish Farmers of America (CFA) and the Catfish Farmers of Mississippi were organized with the help of the state’s commissioner of agriculture and commerce, Jim Buck Ross. These groups worked to share ideas, solve industry problems, and present a unified voice when representation of the industry was required. CFA members were instrumental in creating local mills to make special feed for raising catfish. Mississippi State University was the first institution to conduct research on the nutritional requirements of catfish, with researchers determining protein, carbohydrate, energy, vitamin, and amino acid requirements for catfish. During the 1980s hand filleting of catfish became automated, resulting in an enormous increase in the amount of catfish that could be processed. Service companies also began developing special harvesting boats, nets, and gear, while other companies developed electric- or tractor-powered paddlewheel aerators. 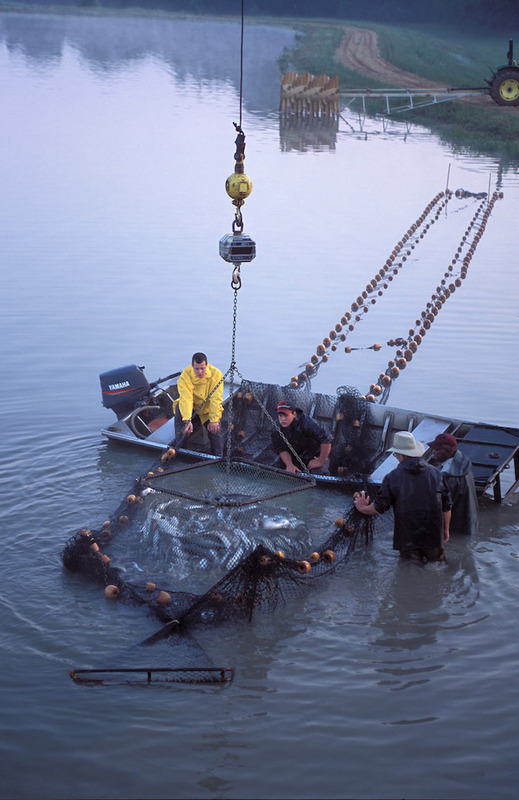 The CFA and the state catfish farmers associations of Mississippi, Alabama, Arkansas, and Louisiana helped to introduce these innovations to producers. An annual fish farming trade show started in Greenville to promote and sell machinery, feed, software programs, supplies, and chemicals. In 1986 the CFA created the Catfish Institute to advertise and market US farm-raised catfish products. By 2000 the success of the industry attracted imports that directly competed with existing processor markets. In a span of eighteen months, frozen “basa” and “tra” fillets from Southeast Asia replaced nearly a quarter of the catfish fillet market previously held by US processors. The US Department of Commerce’s International Trade Commission ruled that these substitute products were being sold in the United States below fair market value and levied duties (tariffs) on the major Vietnamese fish importers. To support U.S. aquaculture, in 2004 the US Congress passed the Country of Origin Labeling (COOL) legislation, which requires retailers to mark fish and shellfish products as either farm-raised or wild-caught and identify the country of origin. The US and Mississippi farm-raised catfish industry has struggled during the last few years, with low selling prices at the wholesale and producer levels and high input costs, primarily for feed and fuel. One result has been a decrease in the amount of Mississippi land devoted to catfish production from 112,000 acres in 2001 to 92,500 acres in 2007 to 37,000 acres in 2015. This decline cost the state more than 5,000 jobs in that period, though Mississippi remains the nation’s leader in catfish production.